I’m currently in the room at TechTarget’s Worldwide ROI Summit listening to a panel discussion with Voula Hantziantonakis (TechTarget), Tom Campbell (Yellowfin BI), and Colin Mann (Mitel). Just a moment ago, Colin Mann spoke about the challenger sales methodology and how, in an enterprise sales environment, there is increasingly a community of decision makers that you need to influence, rather than just one key stakeholder. Most of the enterprise B2Bs that I meet are adopting some form of the challenger model. An education-first, hyper tailored approach, where the subject matter experts (on the vendor’s side) take control of the customer conversation and prioritise high value interactions that are focused on the prospect’s problems. In the panel discussion both Tom and Colin gave an insight into their respective ABM processes. 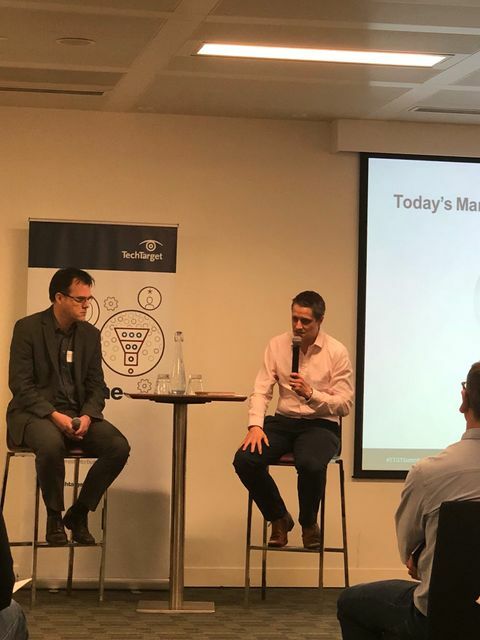 They both mentioned the role of BDRs as an intermediary step between marketing (who spearhead the ABM initiative) and the Salespeople who eventually end up in a dialogue with the prospect. My understanding of the reply was that this is often a good strategy, particularly when there is a complex organisational structure (in the public sector for instance), though there are often operational challenges involved with doing this effectively.